KYUCHAN is the most-loved pickled cucumber in Japan. Japanese pickles first appeared in texts dating from the 8th century, and have been cultivated throughout a long history of cuisine. Even though our current lifestyles have changed significantly, Japanese pickles are something familiar that our dinner tables cannot go without. Among Japanese pickles, KYUCHAN is the most famous and is enjoyed by a great many people. KYUCHAN was born in 1962. KYUCHAN uses individual wrapping so that customers can enjoy Japanese pickles of consistent quality anytime and anywhere, a feature that can be called revolutionary for the Japanese pickle market of the time. KYUCHAN was advertised on TV from the beginning, and grew after becoming a big hit. Even now, over 55 years since it first went on sale, KYUCHAN enjoys brand recognition of over 90% in Japan, and we are making efforts to share its delicious flavor with the rest of the world. KYUCHAN consists of very particular ingredients. KYUCHAN is made from a type of cucumber called "suyo". 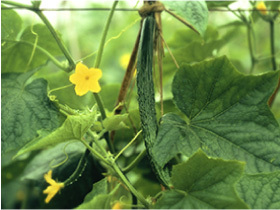 With a thin skin and a meaty quality, this cucumber features a wonderful texture, and we have continued to support its flavor since the birth of the product. The tasty "crunch, crunch" sound that KYUCHAN makes when you eat it is the result of the product's ingredients and manufacturing method. You can't resist KYUCHAN's soy sauce flavor! 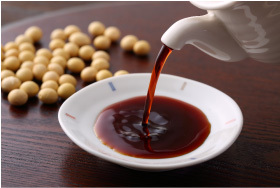 Through a unique production method that combines three carefully selected, pure-brewed varieties of soy sauce, we have pursued a soy sauce with a rich aroma and deep flavor that can only be found from KYUCHAN. KYUCHAN is the perfect complement to cuisines from all over the world. KYUCHAN works well not only with rice dishes, but also with recipes for sandwiches, sushi, pasta, and more. New collaborations between KYUCHAN and food from around the globe are just beginning. CUCUMBER, SOY SAUCE(SOYBEANS, WHEAT, SALT), WATER, MONOSODIUM GLUTAMATE, GINGER, VINEGAR, SALT, ACETIC ACID, LACTIC ACID, SESAME, SODIUM ASCORBATE(PRESERVATIVE), DRIED BONITO POWDER, PHYTIC ACID(RICE), RED PEPPAR, ADIPIC ACID, FD&C YELLOW NO.5(TARTRAZINE), FD&C YELLOW NO.6(SUNSET YELLOW FCF), DISODIUM 5'-INOSINATE. 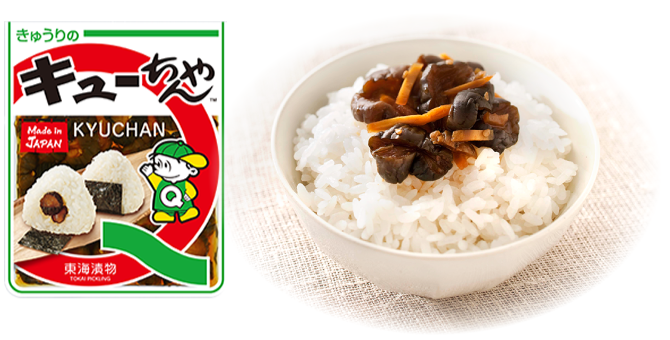 CONTAINS WHEAT, SOYBEANS AND FISH(BONITO). Avoid direct sunlight, heat and humidity, please save.